It is popularly accepted that William Shakespeare’s was born 23 April 1564. However there is no record of the birth, only his baptism on 26 April 1564. At that time, it was common practice for children to be baptised between two and four days after the birth and so it is supposed that Shakespeare was probably born on 23 April. What did William Shakespeare’s father, John Shakespeare, do? John Shakespeare was a glove maker. Gloves were typically made from animal skins he’d prepared such as goats, calves, sheep, deer and even dogs. Rabbit skins were often used to line them. John Shakespeare performed several civic duties as a leading figure in Stratford’s community and society. Starting as an ale taster and a bailiff on the town council, he rose to the position of Mayor on the Town Council in 1565. As an ale taster he would have inspected for irregular measures of alcohol and water in certain beers and ales. John Shakespeare also participated in some illegal activities. He sold wool without a license, and lent money at interest. There was a heavy fine in place for participating in both these activities and, probably due to this, he lost his position in the town council around the time that his son, William, was removed from school aged fourteen years. Mary Arden was the youngest of eight daughters whose family were relatively wealthy farmers near Stratford-upon-Avon in Wilmcote. Her father, Robert Arden, was John Shakespeare’s landlord and died when she was aged nineteen years, leaving her the farm in his will. King Edward VI Grammar school is famously known to be the school where William Shakespeare received formal education and thrives today with more than 800 pupils. He would have learned a certain amount of history and literature, but the significant difference to modern education was that he was taught in Latin. Shaping good rhetorical speeches by learning from some of the original Latin and Greek examples will have helped him in his later career as a playwright. Pupils usually attended school from ages 6 to 16 years, but William Shakespeare probably only remained until he was 14 years old when his father lost his standing in the town. What did Shakespeare do after leaving school? The next record of Shakespeare’s life is at the age of eighteen in 1582 when he married Anne Hathaway who was 8 years his elder aged 26. Apart from the age difference, he was unusually young to get married at the time. Anne was 3 months pregnant with their daughter Susanna when they wed and there is speculation as to whether some of Shakespeare’s early sonnets were written to impress her. How many children did the Shakespeare family have? William and Anne Shakespeare’s first daughter was baptised Susanna. Two years later, their twins, Hamnet and Judith, were also baptized. Then, only eleven years later in 1595, Hamnet’s death was recorded in the same church register while William was living in London. Why and when did William Shakespeare go to London? The last record of Shakespeare in Stratford, before he joined the theatrical world in London, was in 1585. There is much speculation about what prompted him to leave his home town and his family, also about what he did during his absence, because records are sketchy and few. During that time, however, we know that he made his mark as an actor and then a playwright, returning home a wealthier man several years later. Whilst in London, William purchased a substantial house in 1597 called New Place which was later to become his residence. Where did William Shakespeare spend his final years? 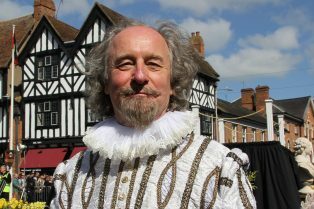 William spent at least the last five years of his life living in Stratford-upon-Avon. His burial is recorded on 25 April 1616 at the age of 52 and he was laid to rest in the chancel of Holy Trinity Church. His wife, Anne Hathaway, was buried next to him eight years later in 1624. Shakespeare had signed his will just one month earlier, leaving his property to the male heirs of his eldest daughter, Susanna. He also bequeathed his ‘second-best bed’ to his wife. This sounds like a poor inheritance but she would have had the right, through English Common Law, to one-third of his estate as well as residence for life where they lived, in New Place house.